Training in skills ranging from mobile phone repair to fashion design has led to 2000 disabled people receiving paid work for the first time or setting up businesses. 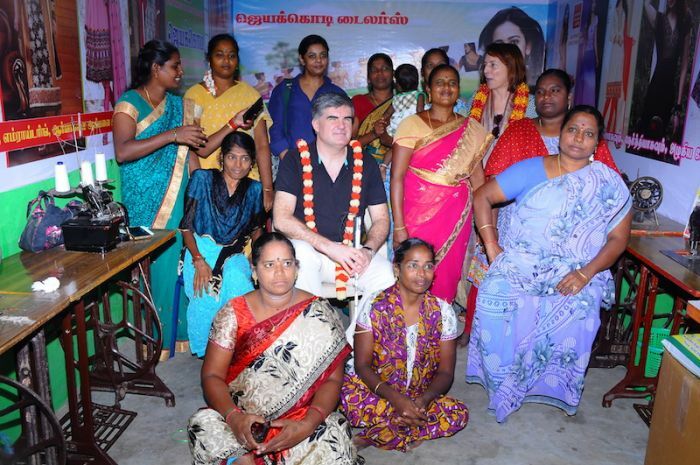 Leonard Cheshire Disability, a leading international development organisation, established one of its flagship ‘livelihood resource centres’ in Tamil Nadu State, southern India, back in 2008 with the support of the Accenture Foundation. Nine years on, Chief Executive Neil Heslop visited this week to celebrate the landmark and meet some of those to have benefited from the vocational skills training provided by the organisation and its partners. Dhanalakshmi, a 36-year-old IT tutor who contracted polio as a child, was among the first to meet Neil. ‘Through the resource centre, I learnt how to budget and write business proposals,” she said. Three years ago Dhanalakshmi had to pay for expensive surgery that used up all of her savings. She was later referred to Leonard Cheshire by a friend. The accounting skills Dhanalakshmi acquired proved invaluable in securing a business loan to set up her first IT tutoring school. “It would not have been possible without the training the centre gave me,” she added. Dhanalakshmi had to persuade her parents to allow her to continue schooling upon contracting polio, causing paralysis in her legs, aged 8. Disability stigma remains prevalent in many parts of the world. There are stubborn misconceptions about what disabled people can achieve in school and work. Leonard Cheshire works to address cultural and practical barriers to education and livelihoods in countries across Asia and Africa. Nearly 24000 disabled people throughout India, Sri Lanka, Pakistan, Bangladesh, the Philippines and South Africa have received training through Leonard Cheshire’s partnership with Accenture. “Leonard Cheshire is on track to meet our target of supporting 100,000 disabled people into work and school through our international projects in the five years to 2020,” said Mr Heslop. Be the first to comment on "2000 jobs milestone reached by Leonard Cheshire Livelihoods Resource Centre in Southern India"